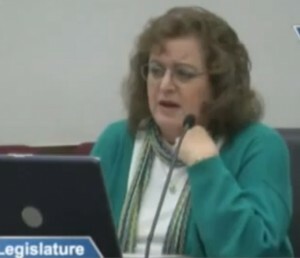 Stop us if you’ve heard this one before: A lady walks into a legislature, elected by a very narrow margin, but she says damn them to hell and starts legislating like she’s the reincarnate of Jimmy Carter (wait, Carter’s still alive!). Needless to say, this makes her constituents absolutely furious, and they decide she has to go! Well the lady is still so enthralled by her self-righteous crusade to save the people from themselves that instead of listening to their wishes (probably figured, “hell, I haven’t done it the whole time I’ve been here, why should I start now?”) she elects to make back-door deals to wring as much political power out of her position before she’s deposed, resulting in her circumventing the democratic process allowing her fellow cronies to stay in power. Ready for the punch line? Her county party thinks this abuse of power is such an awesome thing they go ahead and make her their member of the year! This joke of a process is something you’d expect from one-party ruled, tyrannical dictatorship like the old USSR where maintaining power takes precedent over representing your constituents, but nope that’s the story of Evie Hudak. Ladies and gentlemen, your 2014 Jefferson County Democrats! Now, granted, we have to give them credit for stepping up this year, but anytime you try to follow up awarding the top Democrat in your area to a lady found guilty of robbing the elderly, frankly, you can’t get much lower. This would be hilarious if it wasn’t the epitome of arrogance. Former Sen. Evie Hudak, who resigned her seat rather than let Republicans have a chance of winning the majority, received the Jefferson County Democrat of the Year award Sunday. Some people just don’t listen. If Evie Hudak is the Democrat of the year, the Democratic Party in Jefferson County should be embarrassed. Don’t look now, Colorado, but Jefferson County Democrats are laughing their a$$es off as the joke’s on the rest of us. Because we did it the right way. We nominated a good candidate that impressed the majority of constituents in the district during a major election and that person won, thereby establishing that the largest majority of active voters preferred to be represented by a person who shared the values of the district. The recalls last year were an abuse of a constitutional right, no matter how much spin you make. The petitions were misleading. This permitted a small group of passionate voters to overcome a legitimate election. The argument now is that the two Republicans who won in these two recalls were not actually voted in by the majority of the electorate. HD 29 won a major election with large voter turnout so that argument cannot be made. That is why it is preferable to wait for legitimate elections. Also, we didn't cost the county a quarter of a million dollars by throwing a temper tantrum. And now Robert Ramirez and the Republicans got the clear message that they lost HD29 because their agenda did not represent us. If the constituents were so upset, why wasn't he recalled? In 2010 a male representative walked into the Capitol after winning an election in HD 29 by a very narrow margin – only 197 votes. He then proceeded to vote like he had a mandate and refused to listen to the voices of the constituents who didn't vote for him. It was his presence in the House that gave the Republicans its one member majority until 2012. From 2010 until 2012 the Republicans overreached and Mr. HD 29 voted against his constituents in lock step with his party. In 2012 the Republicans lost the majority by an even wider margin. And the rep from HD 29 was gone. His name was Robert Ramirez. He was soundly beat in 2012 and HD 29 is one of two major districts in SD 19. So what is your point? My apologies Jimi. I misread your post. The 'Idiot List' post is deleted. My apologies Brian. I misread your post. The 'Idiot List' post is deleted. It's called having no shame. God these people are beyond belief. This is what happens when you try to shove laws down the people's throats without giving them a voice. To me Hudak was a shining example of what the perfect Democratic politician should be: an arrogant, lying immoral, factually challenged, do nothing-say anything power hungry, self-serving, deaf-to-her-constituents fool. My apologies to all 3 of you. I need to slow down and take time to read the post. I signed too! They promised this to her in exchange for stepping down so they could hold the majority. Never expect dignity from people who value power over the process. Then add me as #3. I signed both the first petition AND the second – the one which finally drove her out. Applauded when I heard of her resigning. Perhaps more democrat legislators will follow Hudak's fine example…and quit. We can dream, can't we? I proudly worked on the Recall Hudak campaign, and as far as I'm concerned she IS the JeffCo Democrat of the Year.